As Sri Lanka gears up for a presidential election five years after the end a long separatist rebellion, the country, especially the war-scarred North, faces a raft of unresolved chronic problems. Analysts regard many of them as long-term drivers of conflict. The front-runners in the January poll are incumbent President Mahinda Rajapaksa, who is seeking an unprecedented third term (thanks to a constitutional amendment passed by the ruling United People’s Freedom Alliance (UPFA), and his former minister of health, Maithripala Sirisena. Both are southerners. Neither candidate has released his campaign platform. In Sri Lanka’s former war zone in the North, there is widespread apprehension that post-war issues are unlikely to take top-billing. “It is an election dictated by two personalities from the majority community influenced by issues current to the majority community. So far we have not seen either of them showing any signs that they are sensitive to the issues of the minorities,” said Ponnadurai Balasundarampillai, the former vice chancellor of Jaffna University in northern Jaffna. “Whoever wins in January, core questions around national identity - issues of devolution of power, of accountability and reconciliation, and of the equal status of Tamils and Muslims in a Sinhala majority state - will remain contentious. They will require deft handling if greater instability is not to result,” the International Crisis Group warned in a recent report. “If any new president wants to bring normalcy back to the North, then he should be prepared to take decisions that have been long overdue,” said Balasundarampillai. He added that given the southern background of the two leading candidates, chances of such major policy changes taking place soon were slim. “For a Southern leader, these decisions are not as simple or straightforward as they appear in the North,” said Balasundarampillai,said Balasundarampillai, who lived through the 26-year war in northern Jaffna and is one of the region’s most prominent political analysts. He said Southern politicians historically take a hardline stance against power devolution in favour of a powerful national government. IRIN talked to a number of experts to summarize leading concerns ahead of the 8 January presidential poll. 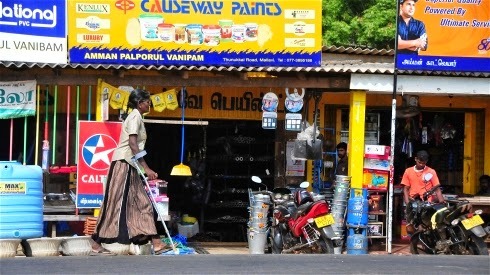 • The North’s economy - In the three districts that bore the worst of fighting, the poverty rate is more than twice the national rate of 6.7 percent (Mullaithivu 28 percent [a national high], Kilinochchi 12.7 percent and Mannar 20.1 percent). Unemployment rates also remain similarly high. “One of the primary reasons for the very limited improvements in the livelihoods of the people in the North and East is the severe limitations imposed on the operations of NGOs - local, national, and international - as a result of the security phobia of the state in the aftermath of the civil war,” said Muttukrishna Sarvananthan, who heads the Point Pedro Institute of Development in Jaffna. National reconciliation - More than five years after the end of the conflict, a root cause for the bloodshed, the demand for more regional power, remains unaddressed. The victory of Tamil National Alliance (TNA) at the September 2013 Northern Provincial Council election was seen by many as an overwhelming endorsement by the northern population of the TNA’s demand for more autonomy. However, the Provincial Council and Colombo remain at loggerheads on almost everything, with a governor (former high-ranking military official) appointed by the president accused of clipping the Council’s powers. • Accounting for the missing - Since the end of the war, the number of those missing ranges from 16,000 to more than 40,000. However, there has been no systematic mechanism to trace. The International Committed for the Red Cross has just begun a nationwide survey of the families of the missing. • Single female-headed families - There are at least 40,000 families led by war widows in Northern Province. Few programmes have targeted these women, and international assistance is waning. • Religious/ethnic tensions - Communal tensions have been rising between hardline Buddhist groups and Muslims in some parts of Sri Lanka. In June this year, violence in Dharga Town, about 60km south of Colombo, resulted in two deaths and at least 80 injured. Though the North has been so far spared such clashes, there is fear among civilians that any aggressive campaigning for more regional powers could result in similar backlashes. “The recent communal riots did not in any way do any good to whatever trust [there was] on the government that remained with northern civilian population,” said Ponnadurai Balasundarampillai, former vice chancellor of Jaffna University in northern Jaffna, heart of the former conflict zone. • Permanent housing gap - In early 2014, officials said US$300 million was needed to build 63,000 new houses destroyed by the war out of a total caseload of 138,651. There has not been any large infusion of funding for such projects this year. • Refugees in India - Over 100,000 Sri Lanka refugees are in India; returns have been very slow since the end of the war and are estimated to number nearly 20,000. The new government must decide whether to bring them home or negotiate a permanent solution with India. • Protracted IDPs - While the government has declared there are no more internally displaced persons (IDPs) in Sri Lanka, informal community estimates place the number of those unable to return to their previous homes and still living with host families close to 80,000. At an election in southeastern Uva Province held in September to elect the provincial council, the ruling (UPFA) mustered 51 percent of the vote, a sharp drop from the 72 percent it received in the same province in 2009. In contrast, the opposition United National Party won 40 percent of the vote versus its earlier 22 percent. The separatist conflict was fought primarily along ethnic lines that pitted the country’s Buddhist Sinhala majority against an ethnic Tamil minority. In recent years, the rise of a small number of Buddhist fundamentalist groups has placed further strain on that historical divide. And while examples of grassroots reconciliation can be found nationwide - NGO-sponsored home visits of families across ethnic divides; Tamil police officers holding language training for their Sinhala-speaking counterparts; seed exchanges taking place between farmers from the Tamil-dominated north and Sinhala-dense south - calls to investigate alleged war-time abuses, account for the missing and act on a government-appointed panel’s reconciliation recommendations continue to mount. Balasundarampillai said widespread unemployment and poverty are likely deciding factors in the upcoming election. Of the country’s 14 million registered voters last year, some 719,000 were in Northern Province. Economists have criticized the government’s nearly $3 billion investment in physical infrastructure in the north as failing to boost local employment, especially among youths and women.